Aim: To evaluate the sound levels generated in dental clinics of conservative dentistry and endodontics. Material and Methods: A decibel-meter with digital readout was used to measure sound levels at different time intervals at the chairside and at the center of the clinic. Minimum and maximum readings during a 3 min interval were recorded. Results: In the post-graduate (PG) clinic, there was significant difference in noise levels between the chairside (66-81 dB[A]) and the center of the clinic (66-67 dB[A]) at certain times. In the under graduate (UG) clinic, noise levels with suction and either high/slow speed handpieces (67-80 dB[A]) were significantly higher than the center of clinic. Suction alone in the UG clinic (63-75 dB[A]) was significantly quieter than in the PG clinic (69-79 dB[A]). Conclusions: (1) Mean sound levels in the working clinics ranged from 63.0 dB[A] to 81.5 dB[A]. These are within the recommended range for dental equipment. (2) With suction and either low/high speed handpiece combination, the PG clinic was significantly noisier than the UG clinic at several time periods. This study aimed to determine sound levels in the clinic with dental equipment at different times of the day and compare these between the UG and PG clinics. A decibel meter (Sound Level Meter 8928, AZ Technical Corporation, Taiwan) was used for recording sound levels in the under graduate and post-graduate sections of the Department of Conservative Dentistry and Endodontics at 8.30 a.m., 9.30 a.m., 11.30 a.m., and 3.30 p.m. At each of these time periods, the meter was activated for an interval of 3 min and the minimum and maximum values recorded. The recordings were made at the chairside and center of the clinic during the normal functioning of the clinic. At chairside, recordings were made with the meter held near the operator's ear while only the suction was being used, when suction was used with the slow -speed micro-motor handpiece and while suction was used alongside the air rotor handpiece. The recordings at the center of the clinic were made with at least five operators. All the equipment that was used for the clinical procedures was in good working condition. The burs and diamond points used in the handpieces were those used by the operators during normal clinical practice. The pressure for compressed air in the dental chair was set at the maximum permissible values as designated by the manufacturers while being compatible with the values prescribed for the respective handpieces. Details of equipment tested in the clinics are summarized in [Table 1]. Neither clinic was air conditioned but had good ventilation. The mean of the minimum recordings and the maximum recordings were calculated for each of the equipments by the chairside and at the center of the clinic for both clinics and at different time. Differences in intra-group measurements of sound between various equipments were analyzed using the Kruskal-Wallis test. Intra-group measurements comparing differences between various times were analyzed by using the Wilcoxon's Signed Sum Rank Test. Comparisons between the post-graduate and under graduate clinics were made with the Mann-Whitney U test. The levels of significance were set at P < 0.05. Results from the PG clinic [Figure 1]a showed no statistical difference at the chairside in noise generated by suction alone, suction with the micro-motor or suction with air rotor (P > 0.05). However, the difference in noise levels between the center of the clinic and the chairside (with either of suction with air rotor handpiece, suction with micro-motor handpiece and suction only) was very highly significant for all the maximum readings (P = 0.001). The difference in minimum readings between the chairside (with either of the three equipment/equipment combinations) and the center of the clinic was found not significant 66% of the times (P = 0.004 at 9.30 a.m.; P = 0.212 at 11.30 a.m.; P = 0.058 at 3.30 p.m.). 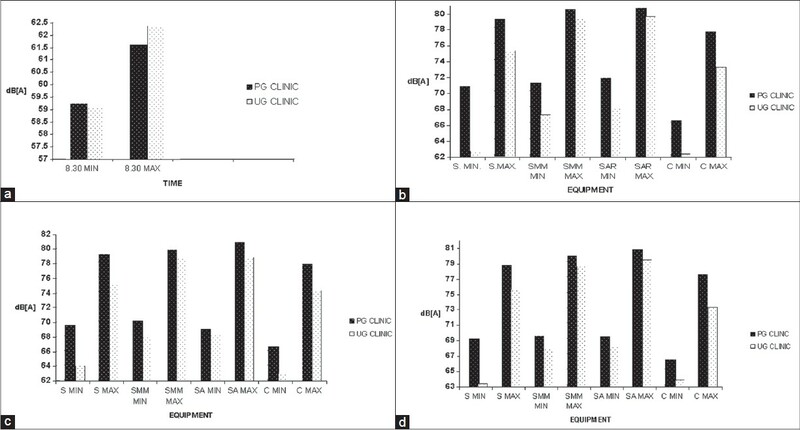 In the UG clinic [Figure 1]b, even though the difference in noise levels between the center of the clinic and the chairside (when using suction with air rotor handpiece or suction with micro-motor handpiece) was found to be very highly significant for both the maximum and minimum values (P = 0.001), no differences existed between the center and the chairside when suction was used alone. The combination of suction with air rotor handpiece or a micro-motor handpiece generated similar levels of noise at the chairside (P > 0.05). Both the PG and UG clinics were significantly quieter at 8.30 a.m. (P = 0.001) as compared with other times during the day. Noise levels during the remainder of the day did not differ significantly. Comparisons between the UG and PG clinics [Figure 2]a-d show that there was no difference in noise levels at baseline measurements (8.30 a.m.) (P = 0.982 for minimum reading and P = 0.182 for maximum reading). With suction, there was always a very highly significant difference between the noise levels at all-time recordings between the two clinics (P = 0.001). With suction and micro-motor handpiece, the two clinics differed significantly for readings at 9.30 a.m. [both minimum (P = 0.006) and maximum (P = 0.05)] and maximum readings at 3.30 p.m. (P = 0.018) but not for either reading at 11.30 a.m. or minimum readings at 3.30 p.m. (P = 0.066). For readings of suction with air rotor handpiece, the differences between the two clinics varied significantly for all maximum readings at 9.30 a.m. (P = 0.008), 11.30 a.m. (P = 0.001) and 3.30 p.m. (P = 0.02) but for minimum readings at only 9.30 a.m. (P = 0.007). Any sound that is loud, unpleasant, or disturbing has been termed noise. Noise can hamper communication, produce stress, induce annoyance and cause a hearing loss in the affected individual, all of which can affect the dentist and his patient. Hearing loss can either be temporary (noise-induced temporary threshold shift) or permanent (noise-induced permanent threshold shift), the latter affecting higher frequencies first. Loudness is a function of both intensity and frequency and can be estimated from various physical measurements. The equipment that was used to measure the sound levels in this study (Sound Level Meter, AZ Technical Corporation, Taiwan) measured the sound pressure level (in dB) by employing a network of filters that represent the frequency response of the ear, to calculate the A-weighted sound measurement (dB[A]). The chairsides in both clinics were noisier than the center, putting the operators at risk. The choice of the timing in this study was in accordance to the patients' inflow to the clinic. The results indicate that the time of the day had no influence on the sound being generated when the patients were being treated. In the UG clinic, when the suction alone was functioning, the noise levels were lower and similar to those found at the center of the clinic. This contrasts to the findings at the center of the PG clinic. A comparison between data from the UG and PG clinic revealed that the high sound levels in the latter clinic were attributable to suction. This high sound level could possibly be affected by the silencer design of the high-volume evacuation (HVE) unit attached to the chairside in the PG clinic. High readings with this suction unit were no different from those recorded when suction was used with micro-motor handpiece or air rotor handpiece. The maximum sound levels that were measured in this study for all equipment are 6-8 dB[A] higher than those reported by Setcos and Mahyuddin. These authors recorded maximum noise levels only. With high-volume suction, they reported values of 68-70 dB[A], for high speed handpieces with suction 72-75 dB[A] and for low speed handpieces again in the range of 68-72 dB[A]. Even with respect to the mean maximum values in the dental clinic for background noises, their scores of 43 dB[A] are much lower than what were recorded in this study (62.5 dB[A]). Designing acoustics of the clinic to allow for filtering or absorbing noises from other sources is important and can include air conditioning and wooden paneling. A study by Bahannan et al. reported noise levels, which are in confirmation with those reported by Setcos and Mahyuddin and slightly lower than what were found in this investigation. Our results tally well with a controlled sound measurement study by Sorainen and Rytkönen  which was performed in an acoustic laboratory with sensitive micro-phones and amplifiers. A study of health-care delivery personnel in a clinical environment showed that overall noise exposure (not just the air turbine) over an extended duration contributes toward NIHL and this was maximal in dental specialists followed by general practitioners, both of which were higher than physicians considered in the study. The physicians only showed signs akin to presbyacusis. These results also demonstrated that right handed dentists exhibited greater hearing loss in the left ear which suffered "toxic noise level damage." The frequency ranges generated with different brands of air rotor handpieces on different substrates (amalgam, composite, and occlusal surfaces of extracted teeth) have also been found to be high enough to result in damage to the hearing apparatus. Studies that have not demonstrated NIHL have been of short duration and a small sample size. A long-term approach with longitudinal audiometric recordings would be the only method of ascertaining NIHL. Loud noise levels in the dental environment can also impact patients and make them anxious. Patients with sensorineural hearing loss will often experience an acoustic phenomenon known as "recruitment," which is an abnormal perceptual increase in loudness. These patients can listen to music at a comfortable level with headphones, or use disposable earplugs during dental procedures. Patients with hearing aids should remove them and replace with earplugs during noisy dental procedures to protect their residual hearing, though this may hamper communication. The factors which may have influenced the results of this study but, which were not accounted for include the effect of the difference in the acoustic structure of the environs of the two clinics, the space area under considerations vis-a-vis the height of the ceiling in the clinic (the under graduate clinic is more spacious with a lofty ceiling), noise from adjacent areas of the clinics, both within and outside the institutes' confined premises and the age of the equipment under consideration. Further research in this field may include assessing the temporary threshold shift after a week-long work schedule and correlating repetitive temporary threshold shifts and permanent hearing loss. Differences existed between equipment combinations at different times of the day when the UG and PG clinics were compared. However, the equipment combinations at chairside in either clinic did not differ with time in the working clinic. The environment in our clinics is one, which carries the risk of inducing damage to the operator. Sense of hearing is of immeasurable worth and deserving of our most vigilant efforts to preserve and protect it. Just as the dental team gears for meeting infection control requirements, it should similarly enforce a hearing conservation program. 1. Taylor W, Pearson J, Mair A. The hearing threshold levels of dental practitioners exposed to air turbine drill noise. Br Dent J 1965;118:206-10. 2. Wilson CE, Vaidyanathan TK, Cinotti WR, Cohen SM, Wang SJ. Hearing-damage risk and communication interference in dental practice. J Dent Res 1990;69:489-93. 3. Sorainen E, Rytkönen E. High-frequency noise in dentistry. AIHA J (Fairfax, Va) 2002;63:231-3. 4. Setcos JC, Mahyuddin A. Noise levels encountered in dental clinical and laboratory practice. Int J Prosthodont 1998;11:150-7. 5. Maximum noise permissible limits in dental operatory, 1998. Available from: http://www.cdc.gov/niosh/topics/noise/stats.html. [Last accessed on 2012 Feb 14]. 6. Standard 7785-1. Part 1: High-speed Air Turbine Handpieces in Dental Handpieces International Standardization Organization Geneva, 1997. Available from: http://www.ada.org/sections/scienceAndResearch/pdfs/0707_hsair_testmethods.pdf. [Last accessed on 2012 Dec 22]. 7. Dyson JE, Darvell BW. Dental air turbine handpiece performance testing. Aust Dent J 1995;40:330-8. 8. Kilpatrick HC. Decibel ratings of dental office sounds. J Prosthet Dent 1981;45:175-8. 9. Vernon JA. Questions and answers. Tinnitus Today 1996;21:21. Available from: http://www.scribd.com/doc/115049445/TT-September-1996-Vol-21-No-3 [Last accessed on 2012 Dec 22]. 10. Goff S. Handpieces highs and lows. DPR Survey, 2005. Available from: http://www.sterilizers.com/articles/HandPiecesSurvey.asp. [Last accessed on 2012 Feb 14]. 11. Dictionary definition of noise, 2012. Available from: http://www.wordreference.com/definition/noise. [Last accessed on 2012 Feb 14]. 12. von Gierke HE, Gros E, Karagodina LL et al. Environmental Health Criteria for Noise, World Health Organization, 1980. Available from: http://www.inchem.org/documents/ehc/ehc/ehc012.htm [Last accessed on 2012 Dec 22]. 13. Bahannan S, el-Hamid AA, Bahnassy A. Noise level of dental handpieces and laboratory engines. J Prosthet Dent 1993;70:356-60. 14. Von Krammer R. High speed equipment and dentists′ health. J Prosthet Dent 1968;19:46-50. 15. Park PR. Effects of sound on dentists. Dent Clin North Am 1978;22:415-29. 16. Forman-Franco B, Abramson AL, Stein T. High-speed drill noise and hearing: Audiometric survey of 70 dentists. J Am Dent Assoc 1978;97:479-82. 17. Sockwell CL. Dental handpieces and rotary cutting instruments. Dent Clin North Am 1971;15:219-44. 18. Coles RR, Hoare NW. Noise-induced hearing loss and the dentist. Br Dent J 1985;159:209-18. 19. Zubick HH, Tolentino AT, Boffa J. Hearing loss and the high speed dental handpiece. Am J Public Health 1980;70:633-5. 20. Altinöz HC, Gökbudak R, Bayraktar A, Belli S. A pilot study of measurement of the frequency of sounds emitted by high-speed dental air turbines. J Oral Sci 2001;43:189-92. 21. Kessler HE. Use of earplugs. J Am Dent Assoc 1960;61:715. 22. Killion M, Devilbliss ED, Stewart J. An earplug with uniform 15 dB attenuation. Hear J 1988;41:14-7. 23. Musicians earplugs, 2012. Available from: http://www.etymotic.com/pdf/erme-brochure.pdf. [Last accessed on 2012 Feb 14]. 24. Clean and quiet air, 2009. Available from: http://www.jun-air.com/catalogs/dental_english.pdf. [Last accessed on 2012 Feb 14]. 25. Section 226219.74 Dental vacuum and evacuation equipment, 2010. Available from: http://www.wbdg.org/ccb/VA/VAASC/VA%2022%2062%2019.74.pdf. [Last accessed 2012 Feb 14].